I hope everyone had a great Thanksgiving. By now, everyone has finally finished all of their Thanksgiving leftovers and have begun to put up their Christmas tree! I spent Thanksgiving with my husbands family and brought home so much food! It was great, especially not having to cook for a little while! Now on to Christmas....this is my favorite time of the year! I absolutely love Christmas, the decorations, the holiday spirit, the time with friends and family. I will be heading home to Miami to spend Christmas with my family but in the mean time, I am trying to enjoy each day this season and share in the holiday spirit with as many people as possible. The holiday season also allows me to get dressed up as often as possible! 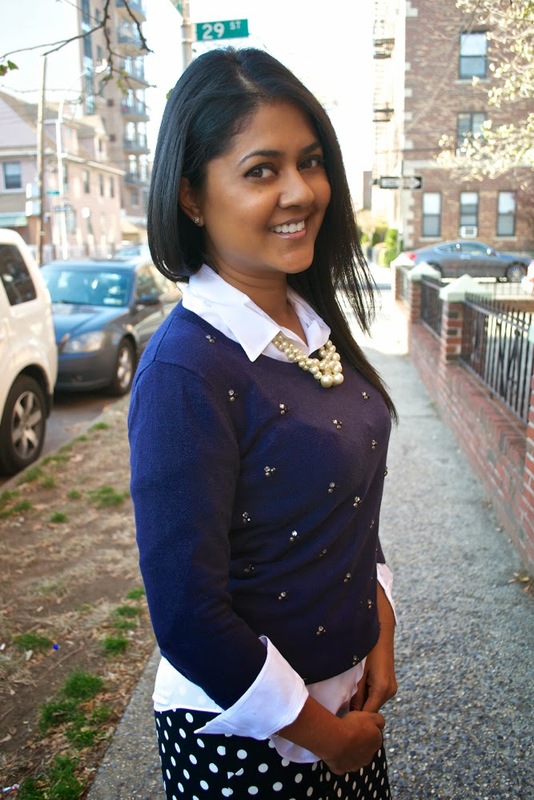 It the warmer days after Thanksgiving, I styled this Gap jeweled sweater to go along with my festive mood. I think polka dots are so adorable and had to purchase this skirt from Banana Republic Factory Store when I saw it. 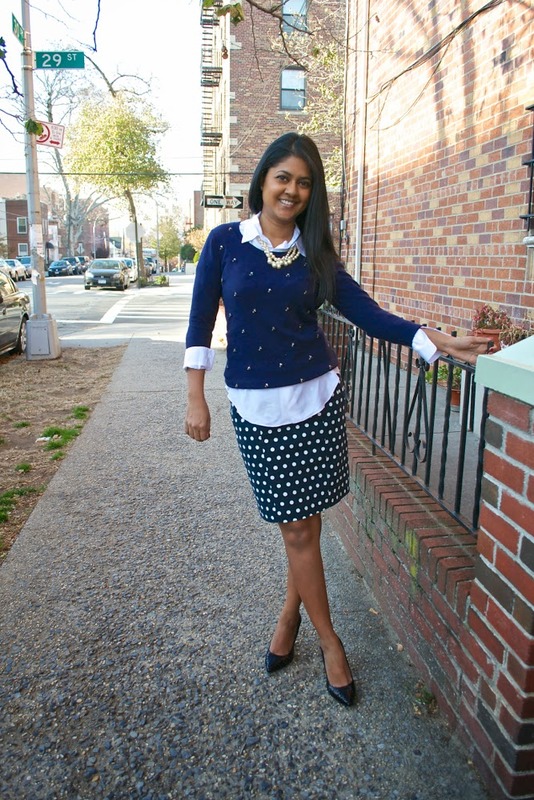 This is a very light take on mixing patterns since the jeweled sweater looks like a smaller polka dot print from far. I layered a white long sleeve blouse to break up the dark blue hue and added only a pearl necklace since the sweater was jeweled as well. 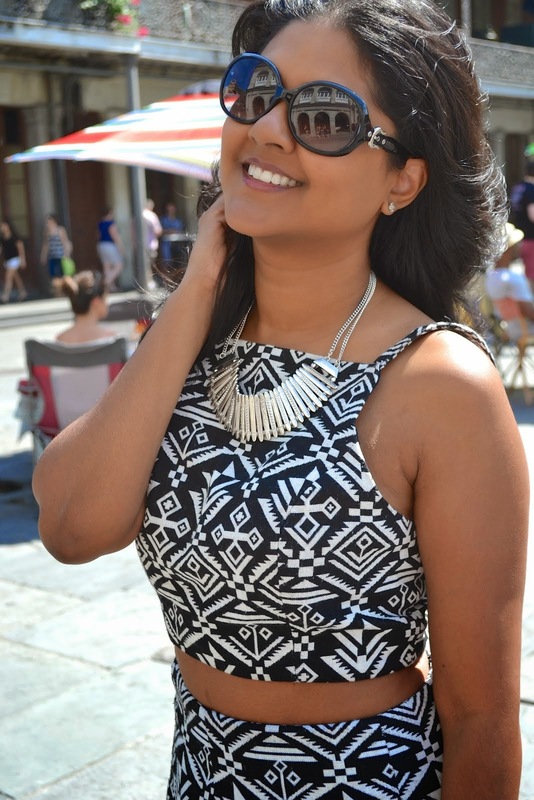 I love this look, its perfect for a sunny day or even the office. If you haven't noticed, I try to buy pieces that I can interchange between the office and going out. The sweater and skirt compliment each other so well and I look forward to mixing them with different pieces in the future.